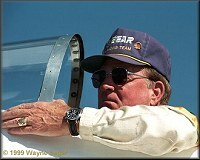 A press release at the website for the Reno National Championship Air Races, (http://www.airrace.org) has announced that Rare Bear Air Race Team owner, Lyle Shelton will be attending the association's annual Pylon Racing Seminar (PRS) during June. Shelton, long sidelined from flying by health issues and the loss of his medical certificate, necessary to keep his pilots license current, has been operating as team owner of his air racing venture for the past several years. Confidential sources had informed AAFO earlier this year that there was a strong possibility that Shelton would attend PRS in June and upon successful completion and re-certification as a race pilot, would assume back up piloting duties for the team. Speculation by another reliable source indicates that Shelton will possibly fly in at least one qualifying session and perhaps, at least, one heat race at the National Championship Air Races in September. Colorado airline pilot, John Penny is currently the chief pilot for the team. Penney won the Championship race last year at Reno during miserable weather and visibility conditions flying against then current champion, Skip Holm in Dago Red. Stay tuned for more information on this historic return to flying status by one of the great pilots of the sport of Air Racing.